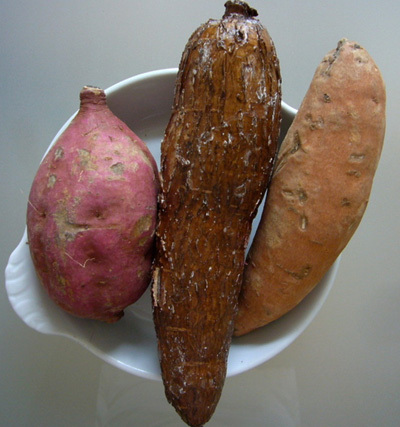 The sweet potato and the taro. As most of you are probably already aware, I have had quite a few food intollerances over the past few years, leaving me fairly limited when it comes to food options and meal times. What you probably don’t know however, is that just recently, quite a few more things have been added to that list. With a list that originally began as no wheat/gluten, dairy, soy, eggs or nuts with the exception of walnuts, it has now unfortunately grown to include many other personal favourites. After a recent trip to see my lovely Naturopath, one which we are finally actually happy with, we are now heading down a new path with all of my tummy issues and we’re trying our luck at the ‘Blood Type’ diet. Now, being type O Negative means that luckily for me, I can still eat my usual meats such as chicken, beef and lamb. It means that I can still have my usual salads made up of lettuce, carrot, tomato and beetroot, but sadly cucumber is now out of the question. Vegetables are mostly fine, I can still have my usual brocolli, beans, pumpkin and sweet potato, which have become a daily dinner favourite as of late, but cauliflower and potato however, my two least favourites, did not quite make the cut. Unfortunately corn was also taken away, which considering kettle popcorn was the love of my life and a daily afternoon staple, tacos were my all time favourite dinner option and corn thins with freenut butter were a perfect occassional treat, this was probably the one that hit me the hardest. Then, on top of all of that, my delicious coconut was also taken away. No more coconut yoghurt with my muesli for breakfast, no more coconut ice cream as a little treat and just when I had discovered how to make my very own chocolate using only raw cacao, manuka honey and of course coconut oil, the coconut oil gets taken away along with everything else coconut. Today though, after being a little bit upset lately about the loss of my coconut, a lovely little purple vegetable had me smiling again. About a year ago, I discovered the delightful purple sweet potato. Similar to the gold sweet potato, however it’s skin is purple, it’s flesh is white and let me just say, it tastes a lot like heaven. So good in fact, that I basically lived off of that and that alone for an entire year. During that time however, it was never overly popular as far as vegetables go and so I was never able to come across its proper name, leaving me to believe that it must have just been your average purple sweet potato. After seeing quite a few chip packets containing the root vegetable taro however, with what looked to be exactly what I had been eating all year and having never seen an actual real life taro before, I started to think that maybe my purple sweet potato was in fact not a sweet potato after all and was perhaps instead a taro. Given that the name didn’t at all change the flavour of the vegetable itself, I of course continued to eat my lovely purple potato. As luck would have it however, within a matter of days of having that realisation, I was again reading through the blood group diet outlines and sure enough, there it was in black and white; all O types are to steer clear of taro. So just like that, yet another favourite was taken away and there I was, completely disappointed all over again. Not only could I not eat cucumber, coconut or corn, regardless of whether it was raw/cooked/popped, now I couldn’t even eat my favourite of all favourite vegetables. It was official, I had decided that this blood group diet just wasn’t going to work for me. Like always though, I did what I was told and I stopped eating my favourite purple vegetable, along with my favourite kettle popcorn, my delicious corn tacos, my corn thins with freenut butter, my favourite coconut everything and my lovely cucumber salads. Today though, all of that disappointment magically melted away. Today there was a big giant rainbow at the end of a dark and gloomy blood group diet tunnel and there was one little girl who was very, very happy to see it shine through. After looking at the vegetables she was pointing towards and again hearing the excitement in her voice, it finally clicked. Within a matter of seconds, my whole entire face had lit up and I was screaming in excitement, hugging her at least ten times over. Sure enough, like always, she was right. Needless to say, I raced over to the vegetable aisle as fast as I possibly could, filled a bag with my favourite purple root vegetable and smiled the whole entire way home. Unfortunately though, dinner was already organised for tonight, so my favourite purple vegetable would have to wait a little while longer to be reunited with my belly. Tomorrow’s dinner however, it had already been decided that tomorrow would be roast night. We would be having a roast with endless amounts of purple sweet potato and considering no one else in my family likes the idea of eating a purple vegetable, it would seem that compliments of the lovely Farmer Pat, my Christmas had just come early.